What is it about Midwestern winter (and sadly sometimes spring) that can totally diminish your run game? The chill in the air, the icy scaled sidewalks, that daunting first inch of snow…man we wanna grab our snuggie and hot chocolate just writing this! We kept trying to figure out how we could keep running safely when the weather outside became frightful Snow solution? 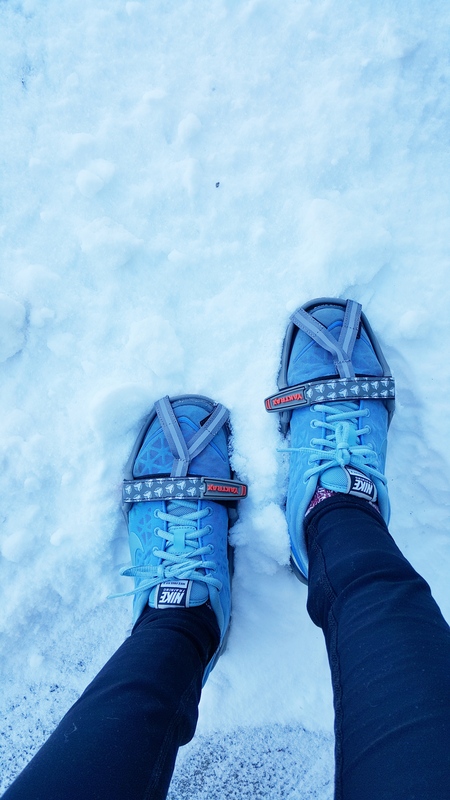 A fluffy white magical Yak picks you up and you sashay through the shivery slush…or you could try YakTrax for a more realistic tool for winter running woes. What’s a YakTrax you ask? The name sounds like a new Dr. Seuss character and just in time for his birthday! But we digress. 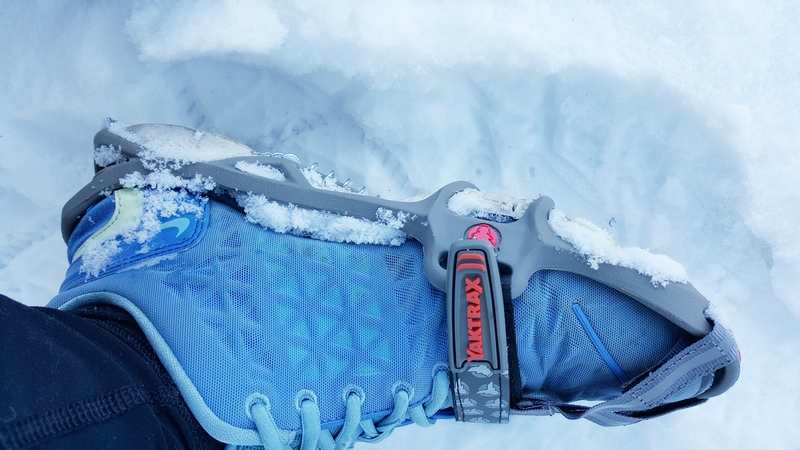 We read a couple of “Best of Winter Running Gear” articles and YakTrax brand traction devices dominated many a list so we ski jumped for joy when we were given a pair from Implus, fitness accessory brand leader, to trek across the blustery terrain. Inspired by a Himalayan Sherpa, the original Yaktrax model features a spikeless coil design that grips the ice and snow with each step. Yaktrax Run’s combination of removable spikes and steel coils, providing 360° of unbeatable traction. Continue your training during the winter with the same stability you are accustomed to on dry surfaces. The Yaktrax Run can be worn in temperatures as low as ‑41° Fahrenheit. Throw your mittens in the air if you just don’t care…about running in the cold. Here’s the positives about YakTrax Run and winter running. 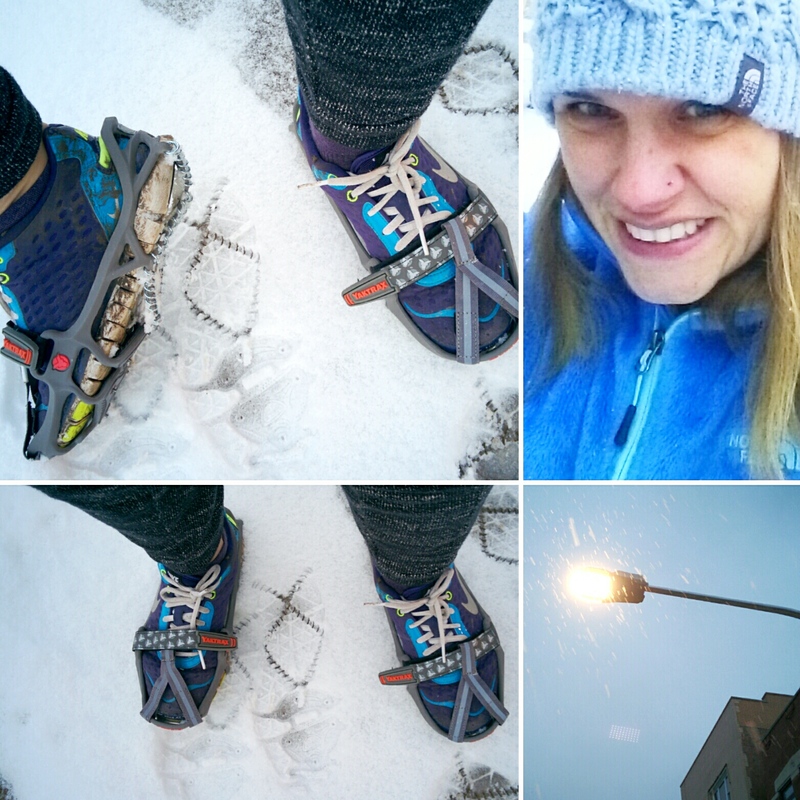 Fit like a Glove – YakTrax Run snuggled around our sneakers and stayed put during our jogs. Dashing Through the Snow – YakTrax did not have a drastic affect on our gait. They kinda feel like you’re bouncing a bit on a cloud of snow. We only put in a 5k distance so not sure how they’d fair on a longer jaunt. 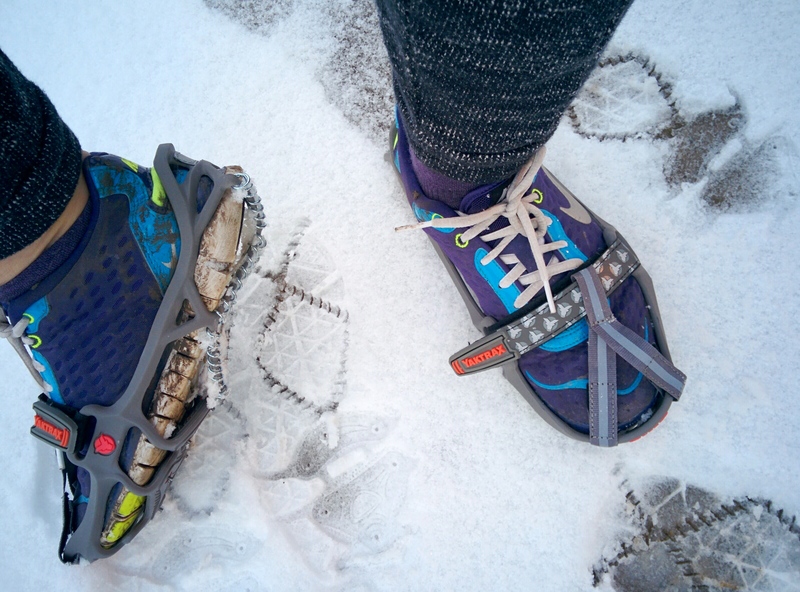 The Weather Calls For Snowzilla – When reviewing other runners, YakTrax Run is made for a specific type of weather. You probably shouldn’t run across an ice skating rink for prolonged amounts of time as they aren’t made for thick ice or feet of snow backwoods running. Stick to mildly icy pavement and moderate snow for best results. Slushy Slush (our new rap name) – Slushy snow can get trapped in the back of the heel so you may have to tap tap tap a tree once in awhile to get it out. For you non-runners, YakTrax carries 6 other types of traction variations for any purpose from your ma’s walks in the afternoon, to your bestie who hits the ski slope every weekend. Strap up your run shoes in some YakTrax Run coils for only $40 here, less than that Yak (about $2000) and besides Yaks weigh 700 pounds so where would you house them? For now, the weather has us chanting the mantra of the post office: Neither rain, nor moderate ice nor snow can stop us from running–now that we have YakTrax Run coils. Maybe a tornado would stop us though…just sayin’. What do you think about YakTrax or other run traction devices? We would love to hear your thoughts. Comment below and until next time, happy trails! If you read our last post, we tried to coerce you into running the Fit Foodie 5k…we are still trying. Come with us!! One of the sponsors of the race is Pure Canada Maple with their delish maple syrup. Who can say no to a big ol’ stack of pancakes with maple syrup? You can even modify them to make them healthy no grain paleo banana cakes…or something goodish for you :). Here’s some things we didn’t know about PURE CANADIAN maple syrup! Don’t be going for none of that processed syrup wanna-bees. It has many health benefits for runners (or wanna be runners like us). It naturally contains essential vitamins and nutrients such as maganese, riboflavin, zinc (just in time for cold season), magnesium and potassium. Many of these are vital elements for muscle repair. It doesn’t cause the same blood sugar spike as many sugars and alternatives like the oh so pervasive corn syrup. It contains polyphenols similar to those you find in healthy tea, red wine and flax seed and 54 different antioxidant compounds. It has simple carbohydrates that are easily broken down by the body into glucose and used for fuel during exercise. Follow us on race day and look for our #ILOVEMAPLE tweets to learn more. Oh, and, wanna win some satisfying syrup? Enter our giveaway and tell us in the comments what fit foodie recipe could you use Pure Canadian Maple Syrup in to win a maple prize pack*. We would love some roasted brussel sprouts with olive oil, salt, pepper and a dash of Pure Canadian Maple Syrup. *Prize pack may include a variety of the following items: maple water, maple syrup and other maple themed items. Infographic shared from the Pure Canadian Maple website. Fit Foodie 5k Race Weekend: The Most Delicious 5k Around! 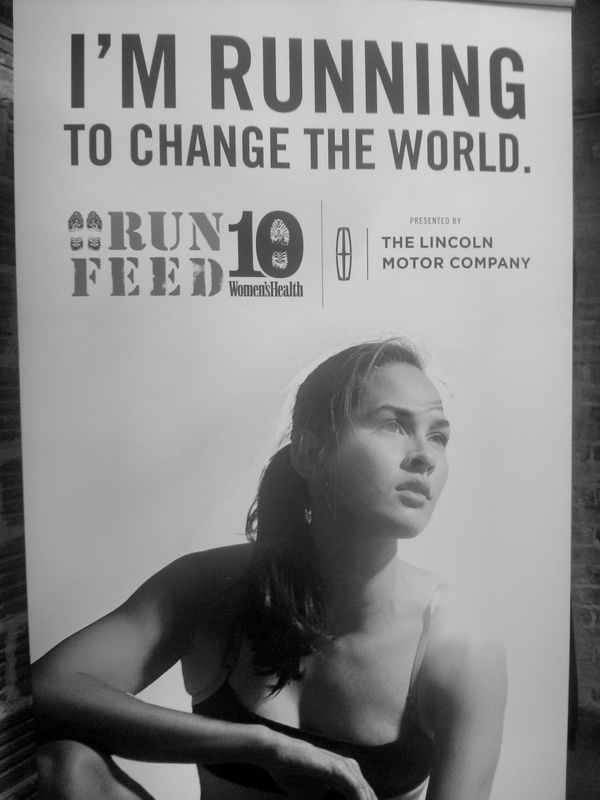 #Run10Feed10 First 10k Run Recap! 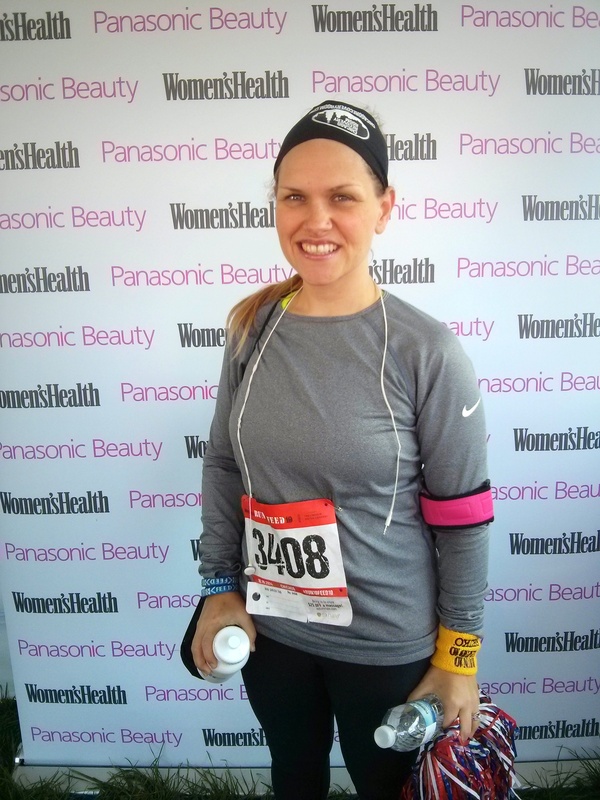 This past Sunday, I ran my first 10k with Run 10 Feed 10 and Women’s Health…and boy are my gams tired! I did it! And next time, I’m dragging Monica to run with me. My popular co-blogger had yet another wedding to attend that day. And what did I learn from the fab event? For those of you moving from 5ks to the next step up, know that it is possible to be ready in 4 weeks! This is coming from someone who used to hate running. 1) Don’t stress! There was plenty of people walking and taking breaks. Your first 10k should be enjoyable and don’t feel guilty if you have to pause to catch your breath. Ya’ll know Halloween is coming, yeah? So I had a lil pumpkin carving party the Saturday eve before and maaaybe stayed up a bit too late. You need your full body strength to be at optimal performance so go to bed on time! 3) But not too much sleep. Ok, so rookie mistake. My anxiety got away with me and while I woke up at 5:30 am, I went back to sleep until 7:30 and then had to pull a Ferris Beuller’s day off and ramp myself into my workout clothes and on to the highway to get to the start line 5 minutes after the race started. Running outside in Chicago is a treat (no tricks here). Other than dodging goose poo in a small section, the race jaunted along the picturesque Chicago lakefront. The continually varied foliage and fauna…oh and the Grub Hub running team with their hotdogs and turkey shaped hats…is way more interesting than staring at the wall while on the treadmill. 5) Revel in your results (and the after party)! My time wasn’t super fast but I have gained about 2 minutes of speed since I first started running. Women’s Health put together a sweet after event with a post race yoga, free post race fuel (Nestle Choco Milk, Bagels and fruit), athletic massages and beauty touch ups from Panasonic. I was surprised to see Allison Sweeney of Biggest Loser there as well. She gave out the post race awards, none of which I won. Maybe some day! Thanks to Women’s Health for allowing me to contribute to this spectacular event.